Classes for the 2019-2020 year begin August 19, 2019. A minimum enrollment of 3-5 full paying students is required for a class to be maintained. 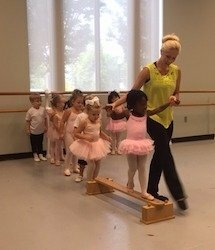 Students are assigned classes and instructors upon approval of Ballet Master, Lona Gomez. Students who graduate from High School are required to take Adult Classes. To withdraw a student, complete withdrawal form, and submit to the Office Manager (ttimmons@spartanarts.org). A withdrawal form must be submitted to ensure a refund. INCLEMENT Weather. Please note that we follow the openings/closings of the Chapman Cultural Center. We will try our very best to notify of any changes due to inclement weather via email and FaceBook. The Center for Dance Education Toddler Division for 2-3 year-olds focuses on movement, music and creativity.This class is designed to introduce the very young student to locomotive movement and music, combining stories and music in a child-centered setting supporting and developing body awareness and rhythm. The Center for Dance Education Tap and Twirl Division for 3-5 year-olds focuses on an imaginative introduction to tap and jazz. This child-centered class combines a gentle introduction of tap and jazz movement and vocabulary with the mindfulness of the age of the student. The Center for Dance Education Creative Division focuses on creativity, fostering a love of dance, group interaction, and the joy of self-expression. 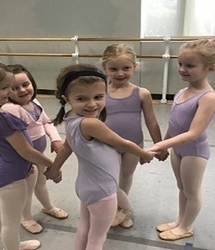 The class is ballet based.The Creative Movement syllabus is designed to gently introduce our youngest students to a happy and safe classroom environment, while instilling the physical and emotional confidence to explore and create. This class is open to boys and girls. Social skills are also developed through collaborative and cooperative games. Creative Movement students participate in the end of the year dance demonstration in the Chapman Cultural Center. 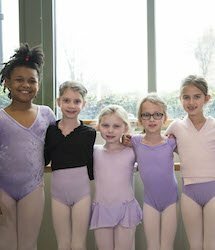 The Recreational Ballet Student Division consists of Pre Ballet through Ballet V. The primary levels foster a love of ballet while following a more formal ballet class focusing on rote. 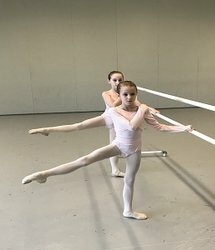 The intermediate levels provide the students with solid classical ballet technique as well as continuing to develop increased strength and coordination focusing on rote. The upper levels continue to build on the intermediate level, in which musicality and more complicated combinations are introduced. The Recreational Division has a structured syllabus as well as detailed objectives for each level. All Recreational Ballet Students advance according to individual progress in acquiring technique and strength. The Open Student Division offers optional discipline classes for students interested in Tap/Jazz, Lyrical, Modern, Contemporary, Stretch and Strengthen, and Irish. 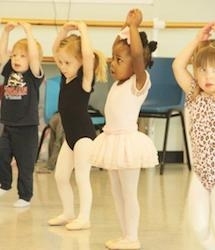 They can be taken on their own or in conjunction with ballet classes. The Lower Division is designed for the more serious student and is designed to provide the student with a focused, challenging curriculum based on rote. Placement is through audition only and each student is carefully evaluated for continuation in the Division. A criterion for acceptance is an anatomical structure suited to the demands of a challenging rote based curriculum. The Upper Division serves the serious ballet student with comprehensive training, refining technique, building physical strength, and developing artistry. Past/Current Upper Division Students have been and are accepted on scholarship to elite professional summer intensives/ such as Pacific Northwest Ballet, Boston Ballet, Houston Ballet, San Francisco Ballet, American Ballet Theatre, Pittsburgh Ballet Theatre and Charlotte Ballet. Focus of the Upper Advanced Division is educating through intense training and performing experiences, such as The Ensemble as well as alongside Ballet Spartanburg’s Professional Resident Company. The Open Adult Division is geared for students 18-80 who wish to start dancing, return to a passion for dance, or are looking for a new form of exercise. All classes are offered on a drop in basis. Class cards are available in increments of 4 or 8 classes and expire at the end of the school year in May. Class offerings are Irish step dance, ballet/pilates, tap, and jazz. The Adult Ballroom Classes are taught by Marion Norman. Classes meet on Monday nights in the Ballet Studios from 7:30-8:30pm. Class cards are available in increments of 4 or 8 classes and expire at the end of the school year in May. The Center for Dance Education Trainee Program offers talented ballet students a transitional experience that bridges the gap between the academic ballet setting and the world of professional dance. The Center for Dance Education Trainee Program is tuition based.